Following initial identification by the Center for Vector Biology at Rutgers University and the Hunterdon County Department of Health, the National Veterinary Services Laboratory (NVSL) in Ames, Iowa confirmed on November 9, 2017 the finding of a tick originally from northeast Asia (Haemaphysalis longicornis), also known as the Longhorned tick, on a farm in Hunterdon County. Until that time, this tick was not known to exist in the U.S. How it arrived in New Jersey remains a mystery. 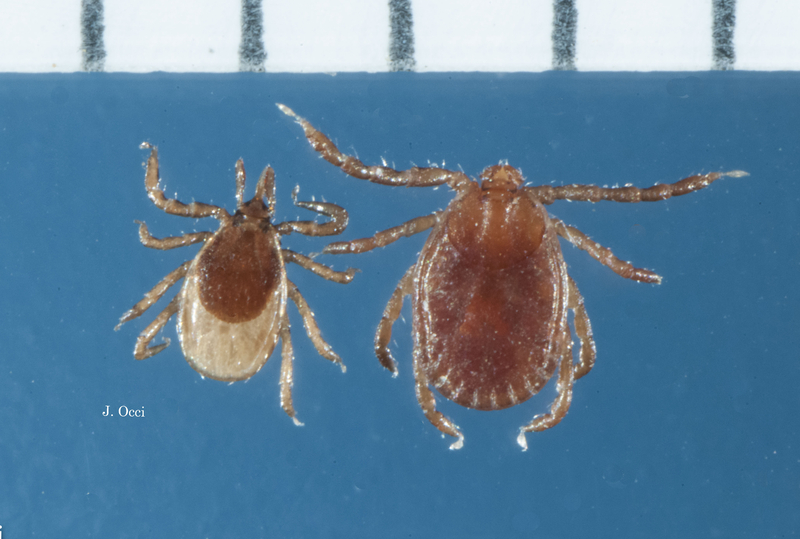 Side-by-side comparison of nymphal ticks: the blacklegged tick (left), and the new invasive Haemaphysalis longicornis, also know as the Longhorned tick (right). Photo Credit: Jim Occi, Center for Vector Biology, Rutgers. For more information about the Longhorned tick, click here. Steps were promptly taken to eradicate the tick from the index property and the animals in and around it. Tests on the exotic tick identified in November failed to reveal any tickborne diseases. Like deer-ticks, the nymphs of the Longhorned tick are very small (resembling tiny spiders) and can easily go unnoticed on animals and people. This tick is known to infest deer and a wide range of other hosts. Therefore, it has the potential to infect multiple North American wildlife species. The State Veterinarian at (609) 671-6400 . The Office of Fish and Wildlife Health and Forensics at (908) 637-4173 ext. 120. The New Jersey Department of Health at 609-826-5964.